Cover of Tales of Giants from Brazil. Born Eusebeia Spicer in West Winfield, New York on September 21, 1880, Eells was an American author who traveled and collected many tales. Married to Burr Gould Eells, she was a faithful collector of stories and published several books of fairy tales. Many of her tales are from South America, Spain, and the Azores, all “far off” distant lands that held a magic for many in the states, collected as she traveled. The author’s collections include Fairy Tales from Brazil, South America’s Story, and Tales of Enchantment from Spain. In the introduction of Tales of Giants from Brazil, the author notes that some of the book’s tales have been adapted from a collection by Dr. Sylvio Romero, Contos Populares do Brazil. Tales of Giants from Brazil is Elsie Spicer Eells’ second collection of stories. 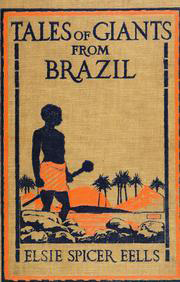 Published in 1918, the volume features stories of giants, for as Eells puts it, “Brazil is the land of giant fruits and giant flowers. Of course it is the land of giant stories too.” The introduction to Tales of Giants from Brazil explains that the Portuguese settlers traveled to Brazil, bringing with them not only goods, but tales. Over time, the Brazillian culture built upon and expanded the folk tales of the “old world” giving them new life. For Tales of Enchantment from Spain, Eells collected Spanish fairy tales and retold them, trying to preserve the stories for North Americans and South Americans. This collection of Spanish fairy tales was published in 1920, and features whimsical stories of magic.